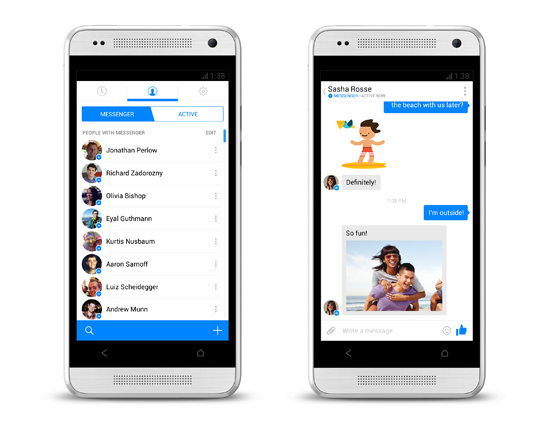 Facebook Messenger (v3.0.1) [APK] — Mobers.ORG — Your Daily Source For Mobile FUN! The Messenger app, though, is about to look a whole lot different. Here a couple shots of the Android version, which I must say is impressively clean. While it obviously chooses not to live and die by Android's design conventions (in fact, it's more iOS 7 than Android in appearance if we're honest here), it looks a heck of a lot better than the existing app, which has an aesthetic to match the standard (read: ugly) Facebook app. The company is also promising significant performance improvements in the new app, and easier ways to find friends to message. You no longer need to be Facebook friends with someone to find them on Messenger - the app can scan your contacts for phone numbers, and if that phone number is associated with a Messenger user, you can send them a message. This should open up Messenger to a substantially wider audience, and make the barrier to entry a whole lot lower for those to lazy to friend everyone in their phone book. Oh, and there are now status indicators to show whether you friends are on Messenger actively, if they're not (or they're on the Facebook web interface), the Messenger icon won't be present next to their name. The new app should begin rolling out to a very limited number of users today, with a wider release in the coming weeks. DOWNLOAD THE NEW FACEBOOK MESSENGER NOW!! NOTE: You may need to uninstall the old version first!